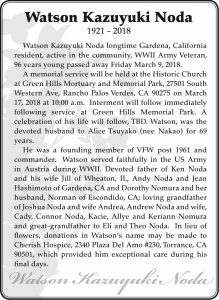 Watson Kazuyuki Noda longtime Gardena, California resident, active in the community, WWII Army Veteran, 96 years young passed away Friday March 9, 2018. A memorial service will be held at the Historic Church at Green Hills Mortuary and Memorial Park, 27501 South Western Ave, Rancho Palos Verdes, CA 90275 on March 17, 2018 at 10:00 a.m. Interment will follow immediately following service at Green Hills Memorial Park. A celebration of his life will follow, TBD. Watson, was the devoted husband to Alice Tsuyako (nee Nakao) for 69 years. He was a founding member of VFW post 1961 and commander. Watson served faithfully in the US Army in Austria during WWII. 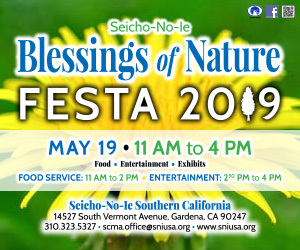 Devoted father of Ken Noda and his wife Jill of Wheaton, IL, Andy Noda and Jean Hashimoto of Gardena, CA and Dorothy Nomura and her husband, Norman of Escondido, CA; loving grandfather of Joshua Noda and wife Andrea, Andrew Noda and wife, Cady, Connor Noda, Kacie, Allye and Keriann Nomura and great-grandfather to Eli and Theo Noda. In lieu of flowers, donations in Watson’s name may be made to Cherish Hospice, 2340 Plaza Del Amo #230, Torrance, CA 90501, which provided him exceptional care during his final days.